As with almost all aspects of the SC Conference, SCinet transcends the big/bigger/biggest paradigm. The planning of each conference takes multiple years, with the work – for most involved – gradually picking up the pace as the previous year’s conference has yet to conclude. For SCinet, the planning revolves mainly around figuring out how to provide our (un)seen services and best “wire-up” the venue to meet the needs of attendees, exhibitors, presenters and other contributors. That “wiring-up” ranges from ensuring there is WiFi coverage in every nook and cranny, along with wired Internet services in tutorial and meeting rooms, to providing upwards of 3 TB per second of external bandwidth to the SC16 exhibit floor booths. Before SCinet goes live each year, there are several periods in which all SCinet volunteers put in a tremendous amount of effort to build a high-speed and high-bandwidth network that runs as smoothly as possible. Setup is when the SC Conference organizers take over the conference venue, and the SC16 Jolly Roger will be raised over the Salt Palace. Freeman will build all the exhibitors’ booths. SCinet volunteers will lay optical fiber to interconnect booths with the SCinet network, and they also will put equipment in all the meeting rooms. Setup is a huge undertaking. SC15 relied on approximately 89 miles of fiber installed on the exhibit floor alone! During Setup, the SCinet team works diligently to turn up all SCinet services and finish work that started during the Staging period. Staging takes place roughly 3-4 weeks before the SC Conference kicks off, when equipment is delivered and configuration and first external connectivity (WAN) deliveries start at the Salt Palace. During the Staging and Setup periods, and especially during the Show, a lot of equipment is needed. Here is where the High Performance Storage aspect of SC really comes into play. 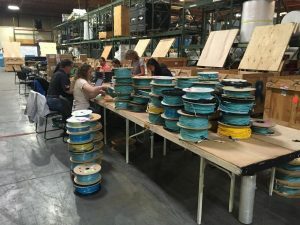 SC, including SCinet, owns a huge amount of materials and equipment, which is stored in a Freeman warehouse in Reno, Nevada. Not all of that “stuff” is needed, nor can it actually fit in most SC venues. So, in May of this year, several SCinet team leads gathered for what is called SCinet Inventory at that Freeman warehouse in Reno to sort through everything that was packed up at the end of SC15 and to prepare and label what is needed for SC16. Sounds easy, right? Well, the SCinet teams tested and respooled most of those 89 miles of fiber from SC15 to prepare it for reuse at SC16 or subsequent SC Conferences. They also tested the switches placed throughout the SC15 venue and upgraded those to run on the most recent software. They checked and reworked the 19” racks with necessary equipment on the SCinet NOC Stage, making sure wheels are oiled and racks are ready for use in October/November. And that doesn’t even touch on all the discussions that took place to determine the best plan of attack to get everything up-and-running, given all the logistical and technical challenges known at the time. 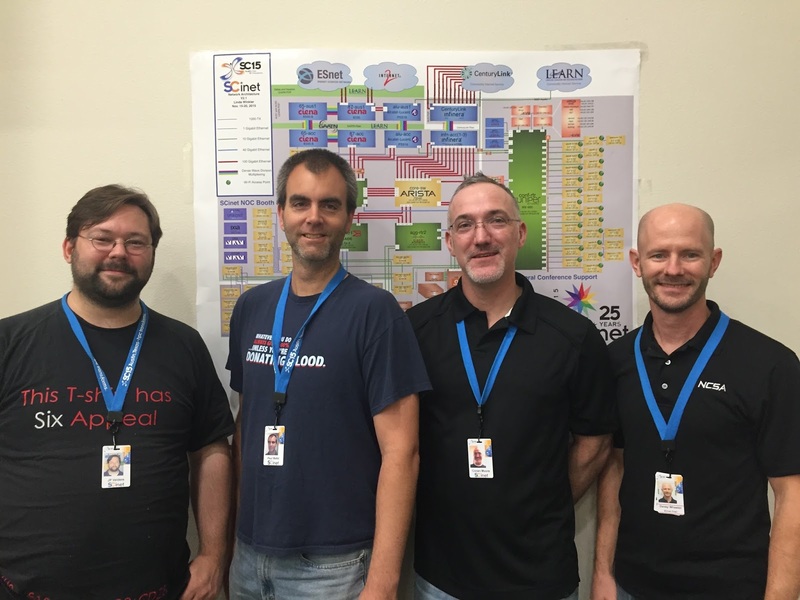 The planning for this year’s SCinet Inventory started in August 2015, when the SC16 and SCinet committees visited the Salt Palace and initiated the whole planning exercise about what equipment and materials might be needed and where and how to overcome any obstacles that might get in the way of SC16’s success. Those plans were examined again and updated as we moved into 2016 (after SC15). This process of reexamining and updating is a continuous one that will take place until SC takes ownership of the Salt Palace in November. The success of any large conference depends on the, often unseen, hard work of many. During the last quarter century, the SCinet team has strived to perfect its routine so that conference-goers can experience a smoothly run Show. The SCinet team will continue to overhaul and improve that routine of planning, Inventory, Staging and Setup to make SC a recurring success.